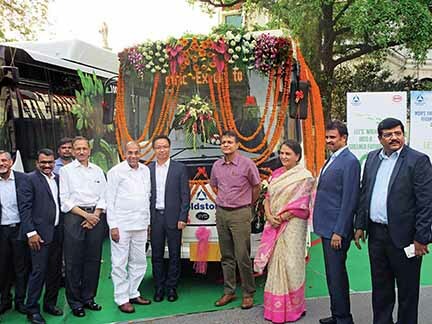 Goldstone BYD has launched a new seven-meter electric city-bus for last mile connectivity. Winning contracts for the supply of electric buses with a number of state owned transport corporations amid competition from legacy manufacturers like Tata Motors, Ashok Leyland and VE Commercial Vehicles, Telangana-based Goldstone BYD has introduced a new, seven-meter electric city-bus for last mile connectivity. Adding to the two electric bus models that the company has been offering for some time in India, the seven-meter electric city-bus, called the K6 eBuzz, aims at operations like feeder services. With new transportation mediums like metro and mono-rail coming up in various Indian cities, the segment of feeder service is displaying a strong potential for growth. The springing up of similar transportation services in neighbouring countries is also showing a strong potential for growth for as far as ebuses like these are concerned. It does not come as a surprise therefore that the first five eBuzz K6 electric buses are going to Nepal. 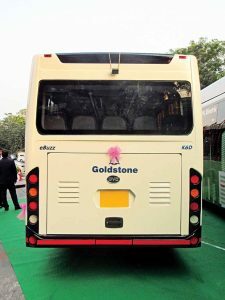 Made as per the specifications of Lumbini Tourism Lines, Nepal, according to N K Rawal, Managing Director, Goldstone Infratech Ltd., the five eBuzz K6 electric buses point at a huge market out there for such ebuses. Claiming to be in discussion with private operators as they find value, Rawal expressed that India provides ample opportunity for local development and manufacture of such automobiles. Weighing 9.5-tonnes and meeting the AIS 052 bus body code specifications, the eBuzz K6 can seat up to 18 people. It is a monocoque construction that could be had in a length of 6900 mm or 7600 mm, and is equipped with an air suspension at the front and rear. Measuring 2160 mm in width and 3145 mm in height, the ebus has a maximum grade-ability of 23 per cent. If the relatively compact dimensions ensure that it can be easily manoeuvred through seemingly narrow city roads and streets, the eBuzz K6 is powered by an advanced Li-ion phosphate battery pack, which takes four hours to charge. With a travel range of 200 km., the ebus generates 180 kW of power and a maximum torque of 1500 Nm. Fitted with an automatic transmission, the K6 is air conditioned and wheelchair friendly. A result of the company practicing a defined approach, the K6 costs Rs.1.4 crores. Employing a strategy of defined approach, which involves the identification of each product, Goldstone-BYD is experiencing higher portfolio costs. Influencing the decision of who will develop it therefore, Rawal expressed, that the K9 ebus costs close to 1.4 crores. The K7 ebus costs close to Rs.1.6 crores whereas the K6 could be had at Rs.1.4 crores. We may incur higher product costs as our operational costs are much lower. “Our good operational performance helps us to bring down the overall cost of ownership,” he added. Underlining the opportunity for local development and manufacturing, Rawal opined that the company would like to reap the benefits of the same. Confident that it would help to counter logistics costs by up to 45 per cent depending on the nature and configuration of the product, Rawal said that they would be able to avoid import duties as well. The reduction in logistics cost and import duties assuming importance, customers, would benefit, bringing down the cost threshold for ebuses thus, making the process of their adoption easier and faster. The most prominent cost center for ebuses being the batteries, which amount to anywhere between 30-45 per cent of the total cost depending on the model. Goldstone BYD is currently sourcing batteries from China. Plans are being drawn to make them locally in India. Not only would this help to optimise costs, it would add to the company’s capability to address the emerging market requirements. Revealing that they have full access to BYD’s technologies for the battery as well as the vehicle, Rawal said, “We are keeping a check on the ownership costs. We are pushing for localisation in an effort to cut down on the import of semi-finished products sourced from BYD.” Working with many suppliers, to increase the level of localisation from the current 35 per cent to 70 per cent, Goldstone-BYD is striving to make the chassis locally by the end of this year. Well aware of the stages that involve the development and approval of a component, and how it will need to be customised and designed as per the requirement, Goldstone BYD is hoping for a change in perception towards electric CVs to effect sooner than later. “We have been working with suppliers. Suppliers are less reluctant to invest than they were a few years ago. Their confidence about the industry is going up, and they are now ready to participate,” expressed Rawal. With two facilities at Telangana and Karnataka each, Goldstone BYD claims to have a capacity to build 600 buses per year. Working towards increasing it to 2100 buses per year by investing Rs.500 crores by the end of this year, the company is confident that electric bus volumes will rise. Till date, the company has sold 32 numbers of K7. 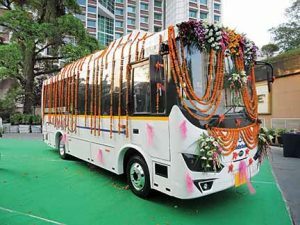 Of these, 25 ebuses were delivered to Himachal Road Transport Corporation, and six buses were delivered to Brihanmumbai Electricity Supply and Transport (BEST). The supply of 40 (K7) ebuses to BEST will soon commence. With an order of 80 ebuses from Bengaluru in-hand from Bengaluru (60 units of K9 and 20 units of K7) in-hand, the company will supply 40 (K9) ebuses to Hyderabad. 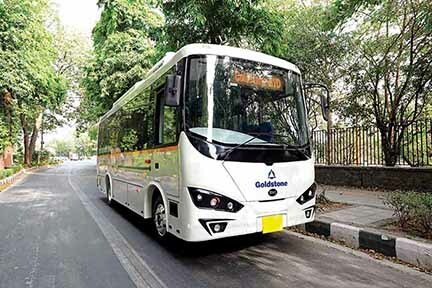 The successful trials of K9 ebus in Delhi, Bengaluru, Hyderabad, Chandigarh, Goa and Rajkot, Goldstone BYD is looking at how soon the volume of electric vehicles increases. “Once the volumes go up, the expansion of electric vehicles will not be a challenge because of the economies of scale,” informed Rawal. nascent stage at the moment, the arrival of K6 ebus hints at the direction in which the market seems to be moving. 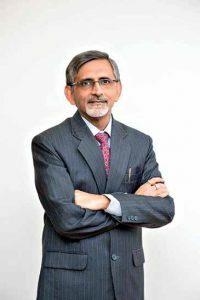 Of the opinion that emobility will grow as more and more players enter the field and experiment with what they think is right, Rawal expressed that incentives under Fame II will provide a boost. He averred that the government is working to tweak the existing policy based on the learnings from the earlier scheme. Stating that they are expecting a reduction in the incentive, Rawal said that they hope that they engineer a policy that will aid faster adoption of EVs. “Once volumes rise, the expansion of EVs will not be a challenge,” he signed off. N K Rawal, Managing Director, Goldstone Infratech Ltd.
Q. How does the synergy between Goldstone and BYD work? A. When we entered the ebus space, we knew that this would be a new field for us. There were incumbents, but we were confident that we could create a place for ourselves with the use of technology and other skills. Technology in ebuses is important because it is not conventional. We chalked out a plan and got BYD to participate. BYD too provided good support. We succeeded in achieving what we wanted to. We still have a long way to go. Q. Who have you supplied your ebuses to? A. We have supplied a total of 31 K7 (nine-metre) ebuses. Six out of the 31 ebuses have gone to BEST; 25 ebuses have gone to HRTC. The delivery of 40 K7 ebuses to BEST will commence soon. To Bengaluru, we will soon supply 60 K9 ebuses and 20 K7 ebuses. The first batch of five K6 ebuses will be exported to Nepal in a few weeks from now. They would be as per the specifications of the customer. We expect that the Indian market will also respond positively to the K6 ebus. We are in discussion with many private operators. They are likely to find value in certain application areas. Q. What is the local content of ebuses you are offering? A. The local content of ebuses is currently 35 per cent. Currently BYD supplies the components. Earlier they were sourced in semi finished condition. The level of finishing is going down as we source locally. The level of local content is going up. Some components are being sourced separately. Post the approval, we are including locally sourced components in the assembly process. The bus body is locally designed as per the requirements of the buyers. Chassis manufacture is likely to start by the end of this year. Component level localisation will continue to grow. We may not increase the number of suppliers, what we would do however is look at more number of components that can be sourced locally. We don’t see this as a serious challenge. Complete localisation will take time. For any new technology, it takes time. What we are confident of, is to achieve more localisation than others. We have a strong support of BYD, which owns several such technologies. It can easily transfer them to us, or to any other component ancillary supplier. Q. Any technological developments are you carrying out in India? A. Currently we are importing technology. That is what BYD brings to the table. The technology is proven worldwide. Because of the ecosystem, we are not designing anything in India as of now. We are however doing a lot of customisation. This is being done with an eye on localisation. We have so far supplied 31 buses only. It would be tough to expect significant localisation at such a small volume level. We are well aware of the local development and manufacturing opportunity in India, and want to avail of them. Doing so will help us to save on logistics costs and import duties. It will help us to reduce prices too. How soon and how much is however difficult to predict since the ecosystem is at a nascent stage. Q. Is Goldstone BYD being very aggressive in bidding for supply of electric buses? A. I fail to understand this. The contracts that we have won, our bids have been 50 to 80 per cent more than the competition. We have won the contracts because of the superior operational performance. The product cost of our ebuses may be more, their ownership cost is low. Their performance is much better, and they can travel longer. This leads to low overall cost per km. If you see, the price of the product was a benchmark, and not the total cost of ownership. The prices we quoted were higher as our products are superior in comparison to those of the others. Q. Have you set a timeline for localisation? A. Considering the customisation and design requirements, we have already achieved 35 per cent localisation. We are looking at localisation as per our requirements, and within a year hope to take it to a level of between 50 to 70 per cent. There are many stages for component development, followed by component approvals. As far as EVs are concerned, the ecosystem is at a nascent stage. We are working with a lot of suppliers. The suppliers did not see volume scope earlier, and were reluctant to participate. Now they are confident and ready to participate. The willingness of the suppliers to participate should help us to set the pace for localisation as an electric bus maker. Q. What about battery localisation? A. Talking of batteries, BYD is a leading supplier the world over. With complete access to vehicle as well as battery technology, we have plans to produce batteries locally. We are currently importing them from China. Local production of battery will help us to cost optimise. Differing from model to model, the cost of battery ranges between 30 to 45 per cent. For the level of localisation that we are looking to achieve, it would also include the battery. In fact, we are looking at cell level (pack) manufacture in the next few months. Some capacity may be set up by BYD directly in India. We will also see further expansion. It is a very capital intensive process, and which is exactly why BYD is doing it initially. The battery plant for BYD will come up in Chennai. Q. What is the current manufacturing capacity? A. Right now we have a capacity to produce 600 buses per year. Once our new facility (at Karnataka) becomes operational by the end of this year, our manufacturing capacity will go up to 2100 units per year. The focus would be to create an ecosystem and then talk about pricing. Q. Do you find grid charging or battery swapping technology suitable for Indian market? A. Every propagator of a technology is certain to say that what he or she is offering is most superior. What matters most is performance however. We are at a nascent stage and the need is for more and more players to come in and experiment with whatever they think is right. This will help electric mobility to grow. Emphasis should be on that rather than on which technology is superior. Let the market determine the best technology. For any technology pertaining to ebuses, the battery accounts for an important component. It’s life depends upon its usage and numerous other factors. When it comes to our products, they are competitive in terms of TCO. And this is inclusive of batteries. Q. What incentives are you expecting from the FAME II scheme? A. I think the government is working to tweak the existing policy based on the learnings had from the FAME I scheme. The challenges faced earlier could be addressed. What we are expecting is a reduction in incentive. They have got experts working on the detailing by inputs received during every quarter. I think everyone has given their inputs. Now the government would be collating everything and taking a decision. Q. Lack of infrastructure for EVs is still a challenge. What are your thoughts? A. I don’t see it as a challenge. It is easier to implement in public transport since vehicle charging is carried out at the depots. The adoption of electric vehicles in public transport is not a big challenge. We conducted a three months trial with DTC bus in 2016. The bus ran as per their usage. So, I don’t really see it as a challenge. The K6 can go up to 200 km, and the K9 can go up to 300 km. As per the market requirements, the range required may be less or more. The margin for tweaking is good in view of the requirements. Q. What are the challenges that you are facing? A. There’s a challenge of skilled manpower. There’s a challenge of the availability of ancillary industries. We are gradually seeing traction build up; the level of receptiveness increase. There is a huge potential, and the entry of new players will help to expand the market quickly. The need is for the creation of a ecosystem that includes skilled manpower. Once everything falls in place, the associated economics can be sorted. There is space for many companies as the market for electric vehicles is at an initial stage. Rather than bother about opportunity, it is necessary to take electromobility to a level where it becomes an option that people would want to exercise. Unless they don’t feel like, it may not be worth the efforts. We have been doing pilots with several customers, ranging between one and three months with their own staff and their own usage pattern. Such trials would give them an opportunity to understand what is good for them. Q. Is the price sensitive nature of the Indian auto industry making it difficult for EVs? A. Once reasonable volume kicks in and technology developments happen, it will not be difficult for EVs to penetrate. Their operating cost are lower than that of the conventional ones. In fact, a lot of things like technology evolution, volume and mindset will come into play.